Super Bowl Sunday = Valentine Crafts for the wives at our Super Bowl Party! The guys watch and scratch their man business while yelling at the TV and we take over one of the dining room tables and get to Valentine craft town. But, let’s face it. 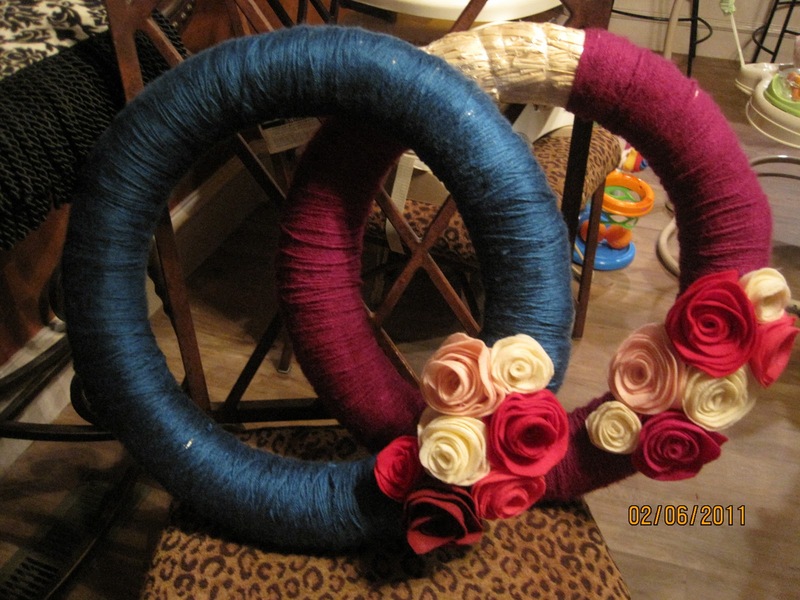 If you have seen one yarn wrapped wreath you have seen them all! There are over 3,500 listed on Etsy! Let’s notice that mine isn’t finished? What the tutorial doesn’t tell you is that wrapping the yarn around the wreath takes FOR.EV.ER. But in the end it was worth it. So if you are low on patience Etsy might be the way to go. I love that my partner in crime was more adventurous and used a deep peacock color while I went traditional in a pink hue. I added a little love bird to mine. And that is my favorite part. UPDATE: This wreath has lasted me over 3 years! It cost about $10 to make and was worth the time. Click here for the tutorial. 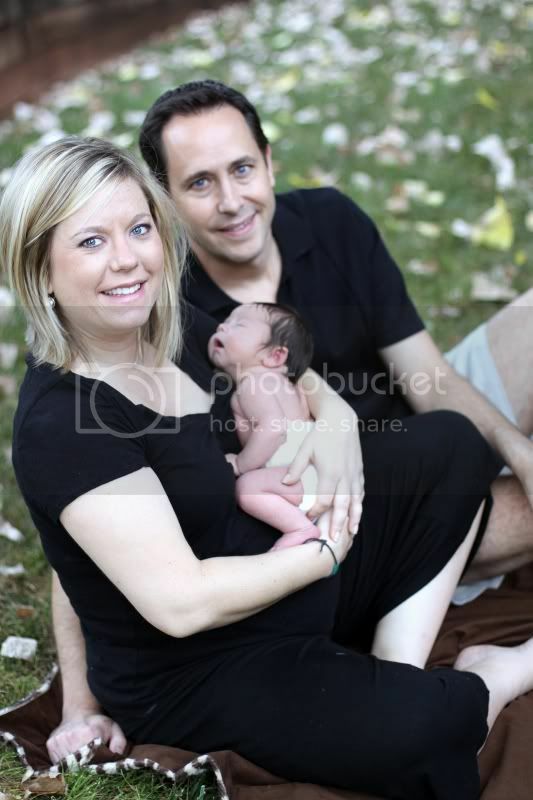 Thanks Danielle Burkleo at Take Heart! 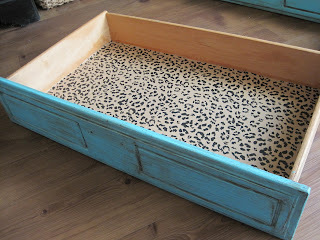 You can check out our other craft projects HERE. How do you celebrate the Super Bowl? Eat the goodies and crafting it up is my idea of a good time! I’m Scared to Paint My…. I recently had a reader email me about a pair of adorable end-tables that she had purchased at an estate sale. I don’t think they were quite her style but she wanted to have them painted to glam them up a little. We planned, shared ideas, and had a game plan to make them fabulous – BUT then she chickened out. This is like so many people – including me at times – that are nervous to paint a piece because they think it will devalue the furniture and I totally understand! 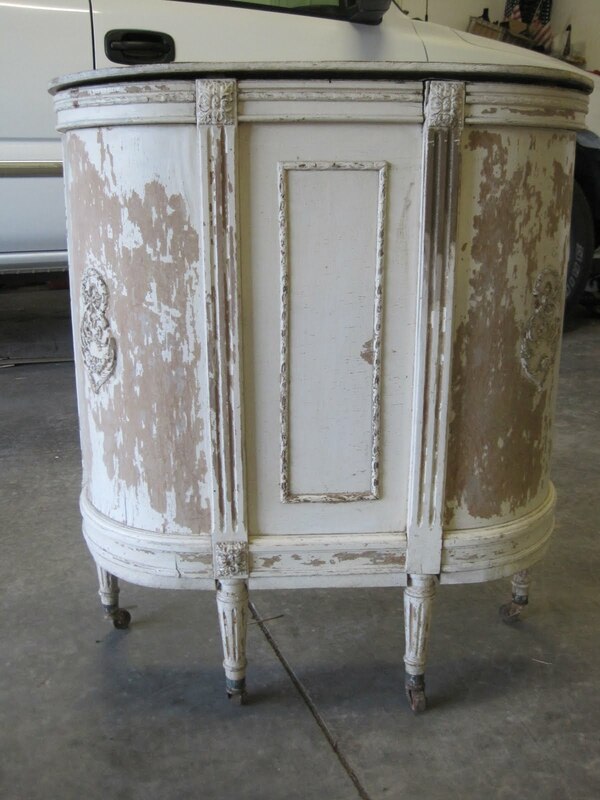 Here is my motto: If you don’t love this piece of furniture then it’s not worth anything to YOU! But if you are still hesitant ask yourself a couple of questions: Am I planning on selling this? If your going to keep it and you are sick of looking at it in your house then for heavens sake – paint it! To find out what a piece of furniture is valuable then look to see who the manufacturer is – it should be located in a drawer, underneath, or on the back of the piece. Are there markings or numbers on the back? Does it have the original hardware? Google, look on Ebay, or Craigslist to see if you can find anything like it. A piece is only considered an antique if it over 100 years old and is considered rare. 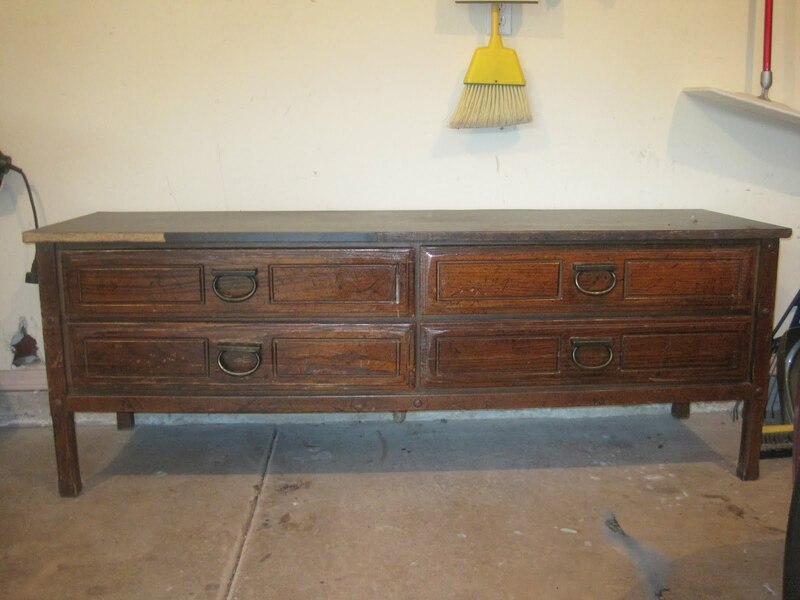 Contact a local antique dealer and ask them about the piece. Many times they will let you email pictures and they can tell you their feedback although this is not an accurate appraisal, it is a good way of getting an idea. Whatever you decide to do – be happy with your decision! You have to live with it – so when you look at it I hope you love it! Have you always wanted to paint your own furniture but are too afraid? Well fear no more! I am now booking one-on-one private lessons to teach you how to make your own garage sale, grandma hand-me-down, sitting-in-the-garage-for-far-to-long-waiting-to-get-the-courage-up, piece of furniture into a beautiful custom piece that you will look at adoringly for years to come! 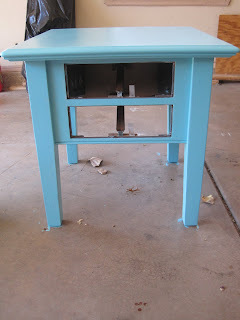 This private lesson includes a detailed shopping list for you to go to Home Depot and purchase your supplies, step-by-step instructions on how to paint your piece, and an in-person lesson from Allison on distressing and glazing. This private lesson lasts about 2 hours depending on the finish you choose. 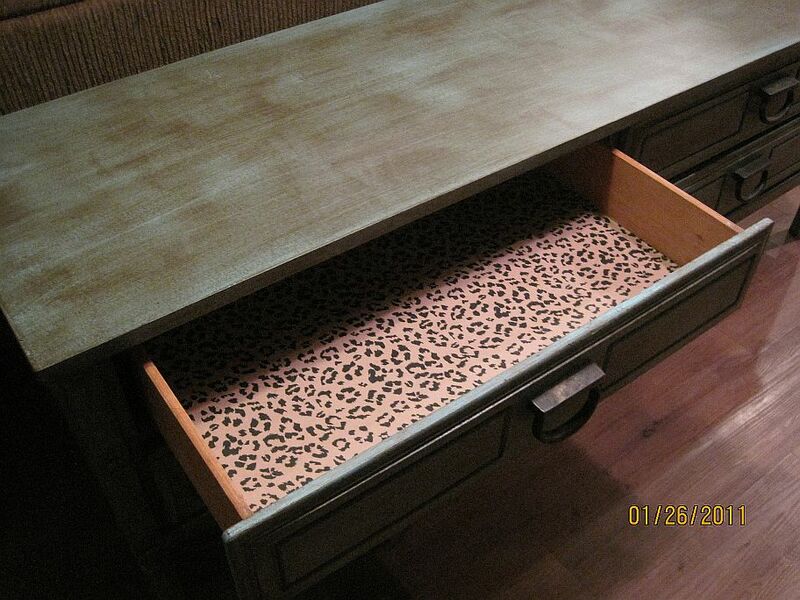 Private lessons can include additional decorative finish techniques such as decoupage, rub’n buff, or stripes and designs for an additional charge depending on the technique you choose. This Deluxe Private Lesson includes a one-on-one workshop, working from start-to-finish together on your piece of funky junk. I provide all materials and tools, including paint, brushes, and any other supplies. This private lesson lasts anywhere from 4-6 hours. Most lessons will be featured on my blog – so you can share with friends and family your proud work of art! *Prices may less or more depending on if your piece is very small or very large. 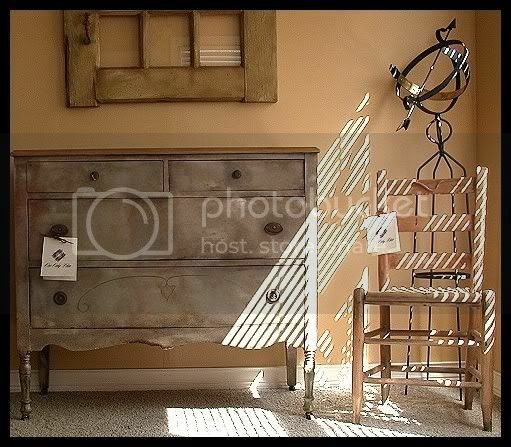 Photos of furniture are emailed before the session to discuss the look you want to achieve. Well she is hot off the press and ready to sell! 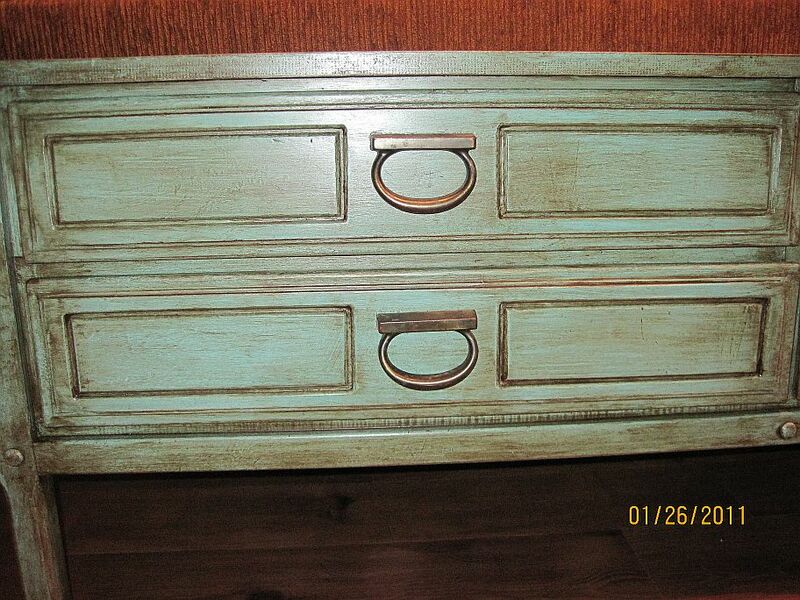 This custom painted turquoise console would be great for a flat screen or for a dresser in a bedroom. Notice the leopard print lining…? I know you need it! You want it! You have to have this! The dimensions are” 2ft tall (24 inches) 20 inches wide and 66 inches long. Here’s a sneak peek at a piece going up for sale this weekend…. 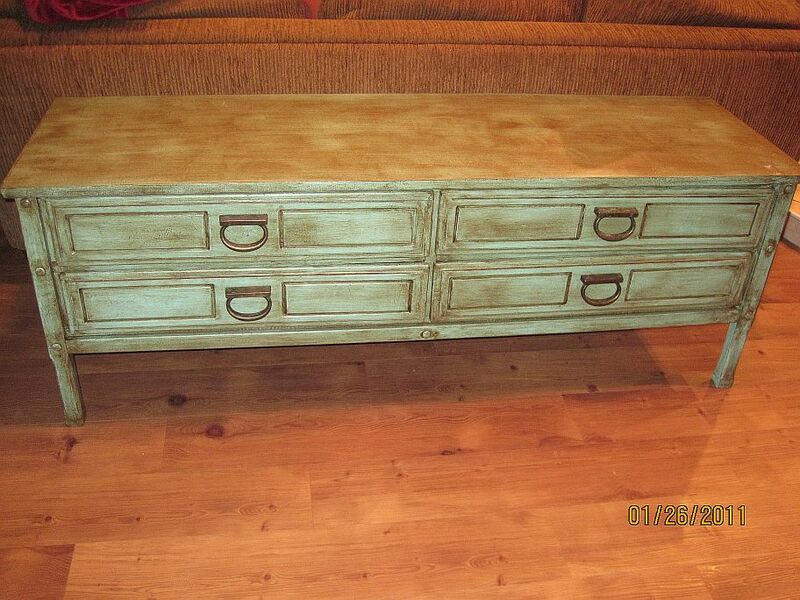 Strip or Sand Furniture? No I am not taking up a new career… But I am asking the same question that I have asked myself so many times – and so many times I was not sure what the answer was. Luckily I have made enough mistakes for the both of us… so here’s how I decide. 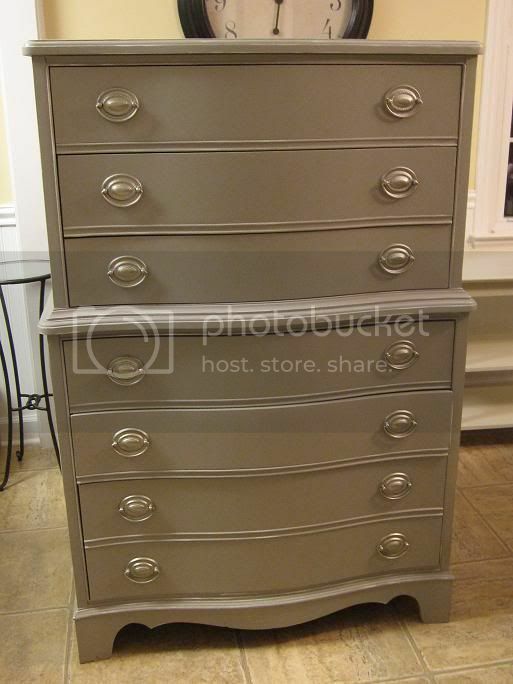 Does my piece or furniture have old or chipped paint? Are there many layers of paint? If so, when I sand it does the surface become smooth or is it still bumpy or uneven? Can you sand it down to the wood underneath? If it is still bumpy then STRIP! What do I use to strip my furniture? I like Citristrip. You can use it indoors because it is not have a super toxic, disgusting, smell like most strippers. Follow the directions on the back- they are pretty easy. Tip: If your piece has a lot of detailing, cracks, crevices, and hard-to-reach places then invest in a copper or wire brush to scrub off the dried stripper. The instructions on the back recommend you use a toothbrush or a cotton swab. THIS DOES NOT WORK! Use a metal wire brush! Walmart and Home Depot sell them for a few bucks! 2. Does your piece have a shiny, clean, or smooth, surface? Then your answer is NO! Don’t you dare strip! There are sooooo many other options you have that are much, much easier, less time consuming, and just plain less headaches! My go-to easy to prep paint is Heirloom Traditions Chalk Type Paint. There is no sanding, no priming, and NO FUMES. You can get 10% OFF + a free gift at Heirloom Traditions Paint’s website using the coupon code REFUNKMYJUNK at checkout. If you don’t want to use a Chalk Type – No Prep Paint then my second go-to product is a spray on a primer- You don’t even have to sand the furniture before applying the primer! It makes almost any surface paintable. I like Kilz spray primer followed by sanding with a 220 grit sandpaper to remove the gritty aftermath of the spray primer. I also to use one of these handle, gun, thingys on the spray primer, or any spray paint for that matter. It will save your hand muscles – trust me! They are around $2.00 – $6.00 at Home Depot and you can use them over and over! Get one! 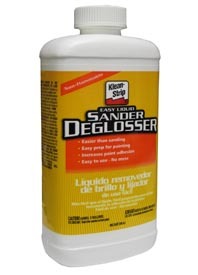 Another option is using a Deglosser– which is also called Liquid Sandpaper. Liquid Sandpaper is a great option if you have a piece of furniture with a lot of detail or curvy legs that is difficult to sand. All you do is pour some on a rag and wipe it on your furniture. Remember- Liquid Sandpaper will not remove old paint or finish (see question #1 above) but it will rough up the surface enough to allow the paint to adhere to the piece of furniture. One of these three methods should be used to prep your piece before you paint it! 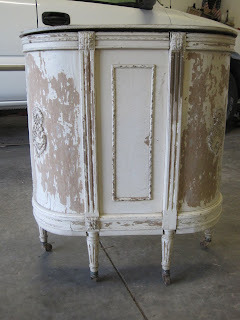 Have more furniture painting questions? Grab my eBook The Lazy Girl’s Guide to Furniture Painting for 115 Furniture Painting Tips, Tricks, and Shortcuts from Professionals. I am always happy to help! But look at her now! I hope this customer, Micki, enjoys this piece in her home for years to come! I am so jealous! She Bought this at a Garage Sale for $10!!! Are you new to Refunk My Junk? Start getting our post delivered to your email Inbox by signing up for our RSS Feed or Follow Us on Facebook or Instagram so you don’t miss a beat. Plus, 14,877 other people are doing it, why not you? 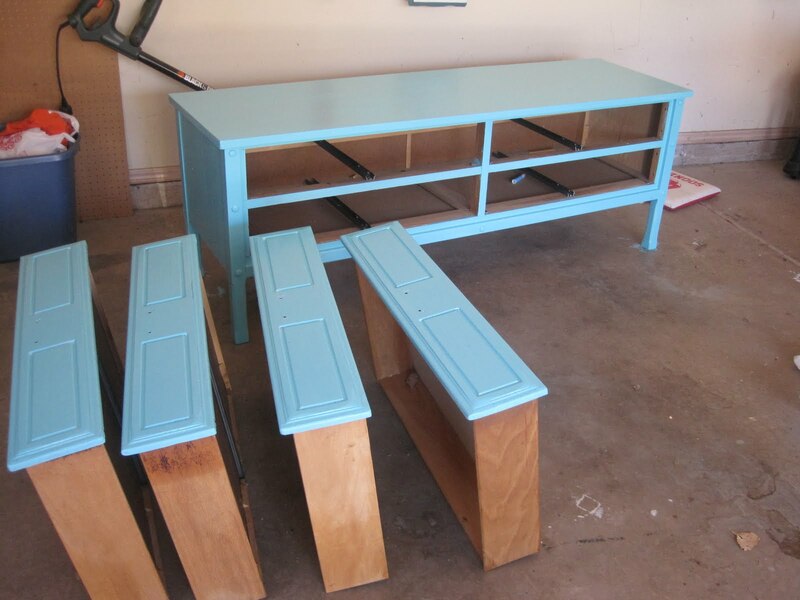 You can see more of our furniture Before and Afters here! She’s Crafty… Not me, the TV Show! I am home sick today with a little stomach bug. I’m sure it will pass, and the good news is that it is 2:38pm and I am just now getting out of bed. Perfect opportunity to catch up on my DVR. There is a show on the Canadian HGTV, but the US it airs on the Ion Life Channel called She’s Crafty . It’s about a woman, Wendy Russell, who loves retro, recycling, and saving money by crafting. Anyway, Wendy from She’s Crafty bugs me. She wears neck ties… See below. Do you see the similarities? 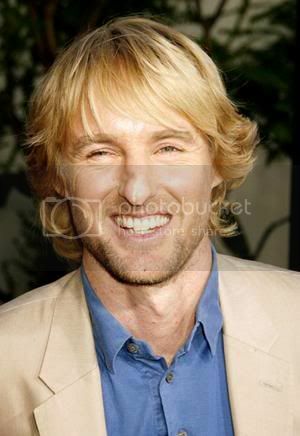 Even her wit on the show reminds me of Owen Wilson! It’s so annoying! I wish I could post a Youtube video on here to show you for yourself, but I can’t find one anywhere! So you will just have to tune in for your self! Oh, one more thing. Even though I watch her show I have never done one craft on there! She is pretty retro and that is not my style, so maybe that is why. But alas, I keep tuning in and I don’t know why! Want More Refunk My Junk? You can Sign Up to receive my posts in your Inbox, Follow me on Facebook, Twitter, or Google Plus! Lookie at what I am working on for a client! Isn’t it fabulous? This was purchased at a garage sale for a STEAL, such a steal in fact that I am not even going to tell you for fear you will be so shocked and riddled with jealousy that you won’t even believe me! She suspected that it might be an antique laundry hamper because the top flips open, but I am not sure. All it needs is some tender love care from Moi and it is going to be a gorgeous, custom, expensive looking piece in her home! She decided on going with red to match a wallpaper in her bathroom, and then I am doing a dark brown glaze to accent. The process goes a little something like this. I started working on it today and I will definitely post the finished product! I’m Back in the Saddle Again! I am back at it and I’ve got a new assistant! I’m also working in this end table. I am going to try a new custom grey colored glaze… Keep your fingers crossed and I will let you know how it turns out! 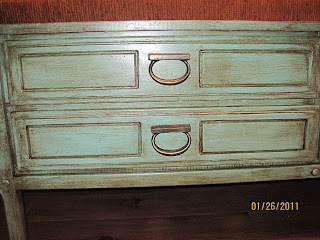 Tonight I am going to see a prospective client to redo a garage sale find… Can’t wait to see what she has for me and help her pick out her colors and glaze! I hope everyone has a great Labor Day weekend!